Skyline Construction & Waterproofing, Inc.
New Mark Painting & Construction, Inc. Comment: The is the backyard of a brownstone in Harlem, Manhattan. It is a rectangular yard measures 23' from the back of the house and is 15'6" wide. There are where the ac/heating condensers are mounted on at wall in the yard. I am looking to put down large rectangular pavers throughout the whole yard, a small deck out right outside the back door to cover a grate and a fence around the perimeter of the yard to cover the neighbors ground floor windows and hide the condenser units and their piping. I want to make sure everything is graded properly for drainage and for proper steps to be taken to stop weeds from growing in the future. Comment: I would like to get an estimate for repairing concrete steps. Comment: Hello We have old concrete floors in our commercial space in Manhattan, we would like to stain them to make them an irregular dark gray. We have 3,000 sq ft that would need to be stained. The landlord will be putting a penetrating sealant on after the staining is complete. Look forward to hearing from you. Comment: there is a small crack in the concrete wall above the third story window. it is very high up, looks like it needs to be sealed and then painted. My handyman cannot reach that high. New York Concrete Contractors are rated 4.74 out of 5 based on 1,143 reviews of 92 pros. 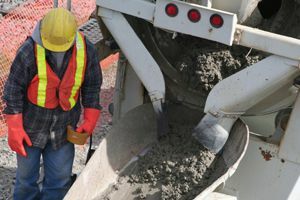 Not Looking for Concrete Contractors in New York, NY?